Note: This appears as Chapter 4 in Missile Defense 2020: Next Steps for Defending the Homeland. Because the 2002 decision for deployment essentially fielded an advanced prototype, every early kill vehicle was unique, handmade in about 130,000 steps. The gradual progress of modernization and increases in capacity have resulted in a further diversity in the actual interceptors deployed. Five main variants of GBIs are currently fielded, in the process of being deployed, or in development. These vary based on their combinations of the kill vehicle and booster (Table 4.1). The Redesigned Kill Vehicle (RKV) will decrease both the diversity and complexity across the fleet, aiding in the production and improving reliability. Even after RKV is fully deployed in 2027, however, the planned fleet of 44 will still include nine comparatively older GBIs equipped with CE-II Block 1 kill vehicles. Four main variants of the EKV have been tested since GMD began intercept tests in 1999: CE-0, CE-I, CE-II, and CE-II Block 1. The CE-0 name signifies a prototype only used in testing and never deployed. The CE-I is the operationally deployed version of the original prototype. In 2008, MDA began replacing obsolete components on some of the CE-I EKVs, along with other upgrades, which resulted in the CE-II EKV. The CE-II, first tested in January 2010, underwent a reconfiguration based on the results of its intercept and flight testing. The newest variant tested, the CE-II Block 1, features an upgraded set of alternate divert thrusters and is currently being applied to the nine additional GBIs being deployed to Fort Greely. Two variants of booster are present in today’s GBI fleet, the C1 and C2, both of which have three stages. The third stage gives the current GBIs extended range, but limits their ability to conduct intercepts later in a target missile’s flight, as the third stage must first burn before the EKV can be deployed. The C1 booster is nearing obsolescence due to lack of available of spare parts. C2 boosters feature an upgraded avionics package to increase reliability, as well as obsolescence upgrades. There are, however, no current plans to upgrade the existing C1 fleet to C2, and the C1 is expected to remain in service into the 2024–2025 time frame. One of the most important parts of the GMD development effort has been the regime of GBI flight and intercept testing. Intercept tests typically involve the launch of an IRBM or ICBM representative target, followed by the launch of a single GBI to engage it. Other flight tests involve only the launch of an interceptor to prove out kill vehicles or other sensor systems. MDA also carries out various ground and sensor-only tests to exercise GMD’s support systems. Figure 4.2. Exoatmospheric Kill Vehicle. Source: Missile Defense Agency. Flight and intercept testing has been among the best ways to discover system flaws not otherwise revealed through ground testing and to validate the fixes meant to resolve them. 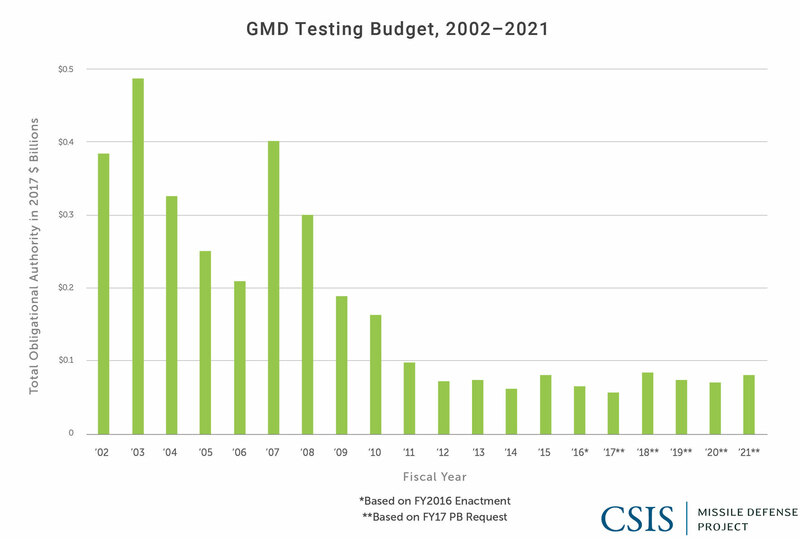 GMD’s flight and intercept testing cadence has been irregular, in part due to the need to investigate several test failures and also a decline in the overall GMD testing budget (Figure 4.3). The GMD testing regime has not revealed fundamental flaws in the technological foundations behind hit-to-kill missile defense. The vast majority of intercept failures have been the result of inconsistencies in interceptor manufacturing as well “test anomalies,” such as malfunctions in test-only equipment, such as with surrogate boosters not originally designed to carry a kill vehicle and with the silos themselves. The historical progression of GMD tests reflects significant growth in the number of operational components, particularly the integration of sensors (Table 4.2). MDA has made efforts to improve the operational realism of its intercept tests, including with the employment of countermeasures, but it is difficult to assess whether these improvements have made the tests as realistic as they could be. The following sections describe the history and lessons learned from over 19 years of GBI tests. A follow-on intercept test in January 2000 failed, resulting from blockage within the EKV’s coolant system that interfered with the performance of the kill vehicle’s seeker. Another test failure occurred in July the same year, a result of a failure in the booster’s data bus that prevented the kill vehicle from separating. This failure was somewhat anomalous, as the modified Minuteman surrogate booster was not originally designed to carry the EKV and would not have been part of any deployed missile defense system.8 It was nevertheless part of the basis on which President Clinton deferred a deployment decision in late 2000. Figure 4.4. IFT-7, December 3, 2001. Source: Missile Defense Agency. In response to recommendations of the review panel, MDA conducted a series of nonintercept tests throughout 2005. These included six ground tests, two target-only flight tests to gauge ground radar performance, and one interceptor-only demonstration flight test (FT-1).18 FT-1 was the first flight test of a GBI tipped with the CE-I kill vehicle. 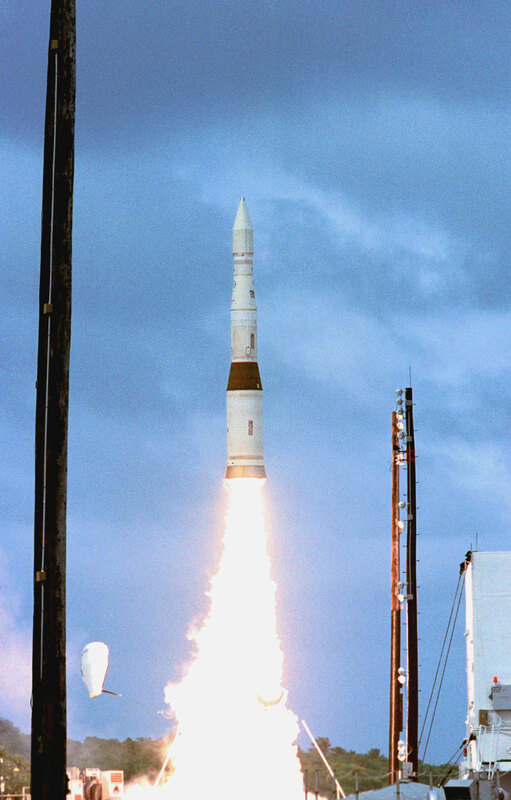 By the end of FY 2005, nine operational GBIs had been emplaced at Fort Greely.19 Between 2006 and 2008, MDA adopted an annual testing cadence that saw three successful intercept tests of the CE-I EKV and Orbital booster (FTG-02, FTG-03a, FTG-05). UEWR SPY-1 SBX TPY-2 STSS OPIR Intercept? Note: This table includes GBI flight and intercept tests. MDA conducts numerous other kinds of GMD tests, including sensor-only tests and ground tests. While important, these tests are not listed here. The CE-II experienced a second failed intercept in December 2010. This failure was a result of a “track gate anomaly” within the kill vehicle. This anomaly had been a “long historical issue,” first noticed in IFT-06 in 2001.32 Initially thought to be caused by electromagnetic interference, the problem was ultimately determined to be the result of high frequency vibrations within the kill vehicle. 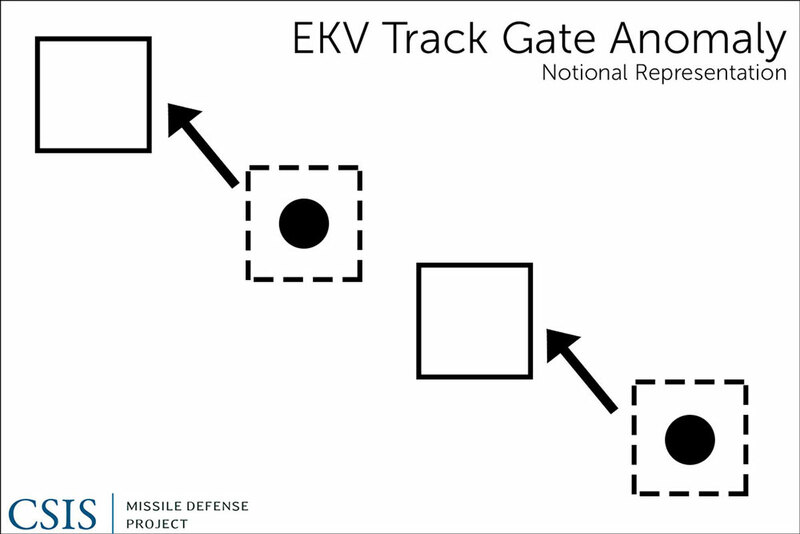 Specifically, the vibrations affected the EKV’s Inertial Measurement Unit (IMU), which caused the tracks to “shift,” resulting in an inaccurate target picture of the incoming warhead (Figure 4.5). Although the anomaly had been known to exist since 2001, the issue had not affected EKV performance until FTG-06, when it corresponded with the inclusion of a more sensitive IMU. Figure 4.5. Notional Representation of Track Gate Anomaly. In January 2016, MDA conducted a nonintercept flight test (CTV-02+) to prove out an upgraded system of divert thrusters, which allow the EKV to maneuver in space. 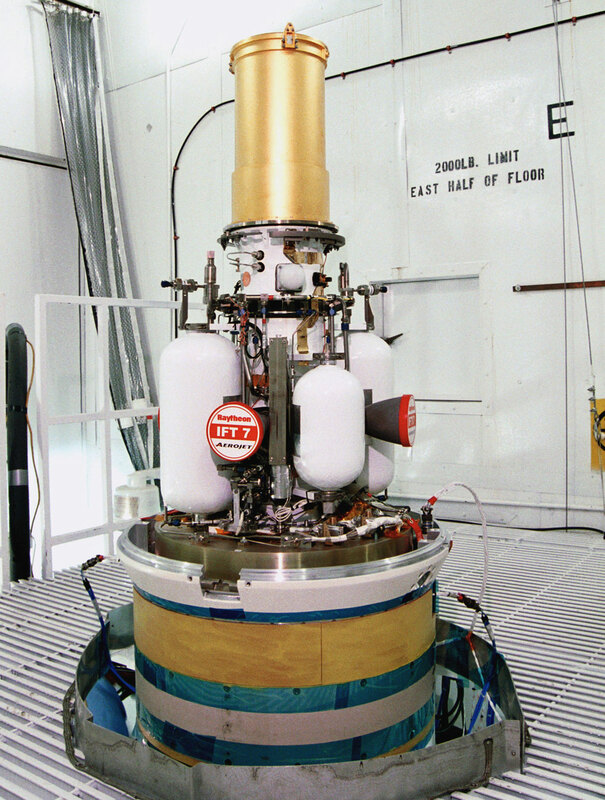 These thrusters were designed to further reduce the effects of vibration of the IMU, the root cause of failed intercept tests in 2010.34 This upgraded version of the CE-II, designated the CE-II Block 1, also features a redesigned fuel tank for greater producibility and reliability. Although interception was not the goal of the test, a target IRBM was launched, allowing the sensor network to gather data for future discrimination techniques. These details help put the long history of NMD/GMD testing record into context. What makes GMD relatively unique is not the presence of failures, but rather that the system is operational even while design flaws are worked out and enhancements made. None of the issues that have arisen over 19 years of GBI testing challenge the basic technological soundness of hit-to-kill technology or of the GMD system overall. One major limitation on the effectiveness of the current GBI fleet is the lack of regular in-flight updates to the EKV. As MDA has noted, ground systems currently “don’t communicate very often today with the kill vehicle.”36 Today’s GMD in-flight communications are inferior in this respect to more recently developed regional systems such as the Standard Missile-3. The current three-stage booster configuration also limits flexibility to perform shorter-range shots at incoming missiles later in flight, since all three stages of the booster must burn out before the kill vehicle can be deployed. A shorter-range shot later in the missile’s trajectory may be necessary if an initial GBI salvo fails to intercept, or if there is insufficient warning time. A fleet composed of only three-stage boosters compresses the battlespace that operators have to engage a set of incoming targets and reduces the ability to intercept “leakers” if initial interceptors fail. Several programs are under way to increase the reliability and flexibility of the GBIs, as well as reduce costs. These include both second- and third-generation kill vehicle programs (RKV, MOKV) as well as a selectable-stage booster. This effort to improve on EKV is both welcome and long overdue. The 2002 deployment decision required the fielding of a kill vehicle that was little more than an advanced prototype and had been created under the strictures of the ABM Treaty. Vice Admiral Syring has described RKV as the first effort “since the 1990s, to improve dramatically upon the EKV, using a modular open architecture based on common interfaces and standards. This effort is designed to improve reliability, availability, maintainability, testability, producibility, and unit manufacturing cost.”41 Various advances have been made over the past 15 years that have been applied to other parts of the BMDS, but similar qualitative improvements have thus far been mostly lacking for GBIs. Even RKV is not a major improvement on EKV in terms of basic concept or design. Some RKV elements have already undergone some flight testing, such as the upgraded divert thrusters tested in January 2016 as part of the CE-II Block 1 EKV.42 Vice Admiral Syring has also stated that the RKV will feature “on demand communication . . . [which] will allow us to update the kill vehicle much more frequently,” noting that this capability is already available for the Aegis system and Standard Missiles.43 The previous Common Kill Vehicle (CKV) effort prepared the way for applying preexisting or common features, such as ondemand communications, that already exist. RKV is also expected to have the ability to communicate with other kill vehicles to reduce the chance that two or more kill vehicles will engage the same object within the threat cloud. Should this effort be successful, GBIs could come to have reliability similar to the Standard Missile and other regional missile defenses. MDA expects to begin RKV flight testing in the 2018 time frame. Planned intercept tests include a two-stage GBI with an RKV engaging an IRBM target in summer of 2019, and a two- or threestage selectable GBI with an RKV against an ICBM-class target in winter 2019–2020. Initial production deliveries are expected around 2020. The MOKV represents a third-generation kill vehicle, building on EKV, RKV, and other current BMDS elements, such as SM-3. It, too, is intended to improve the capacity, reliability, communications, and discrimination of homeland missile defense. MOKV is tailored to the goal of “volume kill,” meaning hitting a number of targets within the threat cloud created by a given threat missile launch. Rather than equipping a single GBI with the single kill vehicle, each booster would carry several smaller kill vehicles, each with some degree of independent guidance. The MOKV could reduce some of the expectation for ground-based sensors to adequately discriminate warheads from debris and decoys, allowing a single GBI to engage multiple objects within a single threat cluster, or perhaps take more than one shot at a single object. During congressional testimony in 2009, General James Cartwright, the vice chair of the Joint Chiefs of Staff, spoke to the shot doctrine issue, noting that the previously planned deployment of 10 GBIs to Europe would only have been able to intercept a maximum of five missiles, “assuming a shot doctrine of two interceptors against each threat missile.”45 The reference to two per target is a sort of minimum for reliability, but the statement presupposes the optimistic assumption of perfect discrimination of the threat cloud, and the GBI shot doctrine is almost certainly higher given the current reliability of today’s system. A more complete description might have described a shot doctrine of at least two (perhaps more) kill vehicles per object within the missile threat cloud that might be a warhead. MDA has described MOKV as “allow[ing] us to go not just to the most lethal object but to the next one and the next one and the next one. And if you can do that, you can kill everything on the scene and you’ll be sure that you got it.”46 Given that these kill vehicles would be smaller and lighter than today’s family of EKVs, an MOKV cluster might look more like a cluster of SM-3 IIA-sized kill vehicles, or even smaller. Putting more than one interceptor on a given GBI round has significant potential to improve shot doctrine and therefore increase effective inventory capacity. Figure 4.6 illustrates the relative improvements in magazine capacity that MOKV could afford under the conservative assumption of 44 GBIs equipped with five kill vehicles each. This notional representation illustrates how the number of targets that can be engaged grows as a multiple of the number of kill vehicles deployed. 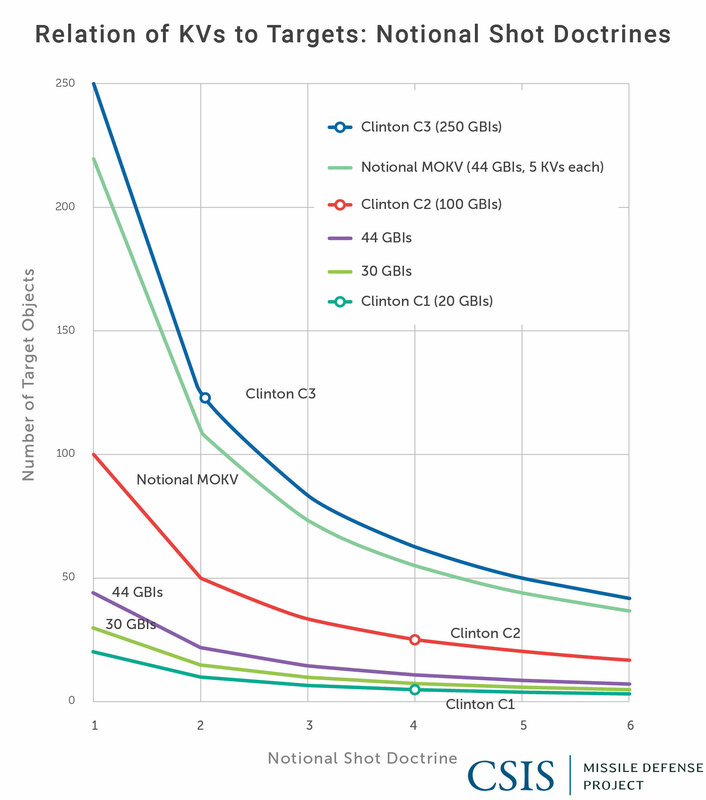 The figure also illustrates how the currently planned field of 44 GBIs compares to previous Clintonera proposals for 100 and 250 GBIs. Figure 4.6. Relation to KVs to Targets: Notional Shot Doctrines. Note: The C1 marker includes the ability to hit five missiles with four additional countermeasures, for a total of 25 target objects with 100 interceptors. The C3 marker represents the ability to intercept 20 targets with five additional countermeasures for a total of 120 targets with 250 interceptors. These numbers align with other estimates from the Clinton era that 80 interceptors would be required to hit 20 targets in the full C1 configuration, suggesting a four interceptor shot doctrine may have been presupposed at that early stage of the program. At least two operational concepts of MOKV are being considered. One of them includes a cluster of more or less identical kill vehicles on a separating adapter in which each kill vehicle would remain essentially autonomous. A second concept uses a single booster/bus, in which the multiple kill vehicles are linked through a single “mothership,” possibly sharing sensors or other support systems. The MOKV development also holds broader potential. The continuing trend toward kill vehicle miniaturization, integration with the larger sensor suite, and improved communications portfolio might also permit a mix-and-match modular approach with other payloads. A GBI carrying a cluster of small kill vehicles might, for instance, be loaded with one fewer in favor of some other payload, such as a dedicated sensor to analyze the threat cloud and communicate that information to the MOKV swarm and to the ground. Payloads might also include nonkinetic effectors, such as a directed energy weapons or some other electromagnetic means to interact with the threat cloud, by clearing debris, heating or popping balloons, or otherwise affecting the warhead and other countermeasures. The MOKV concept might also be a path towards countering the threat posed by missiles with multiple independently-targetable reentry vehicles (MIRVs). In 2016, the MOKV program received $99.5 million in appropriations. The 2017 budget requested only $71.5 million, but with a five-year projection of $388.7 million out through 2021. The program completed its planning and review phase in November 2015. The current three-stage C1 and C2 boosters give the GBIs considerable range to engage targets in midcourse. Long reach was necessary in part to provide coverage from Alaska for threats to all 50 states. A booster that burned only the first two stages, however, would allow the interceptor to engage a target warhead later in the threat missile flight, thereby opening up opportunities for a second shot should a first salvo fail to intercept. The idea of a two-stage booster for GBI is not new; the 10 GBIs that were to be put in place in Europe as part of President George W. Bush’s European third site were to be two-stage interceptors. With the cancellation of the third site in 2009, the impetus behind the two-stage booster was also reduced. Rather than develop the two-stage booster, however, MDA is presently working to make the burning of the third stage optional rather than automatic. As Vice Admiral Syring explained, “It really is not a dif¬ferent design from a booster standpoint. It’s going to be done through software and the warfighter will be able to choose between a two stage and a three stage.”48 The trade-off, however, is a modestly slower interceptor, since it still has to carry the unused third stage as dead weight. A two- or three-stage selectable booster could allow for increased flexibility of any given GBI, as well as a more uniform fleet of common boosters, as opposed to a mixed fleet of two- and three-stage boosters. MDA plans to test this booster configuration in a nonintercept test in 2018. 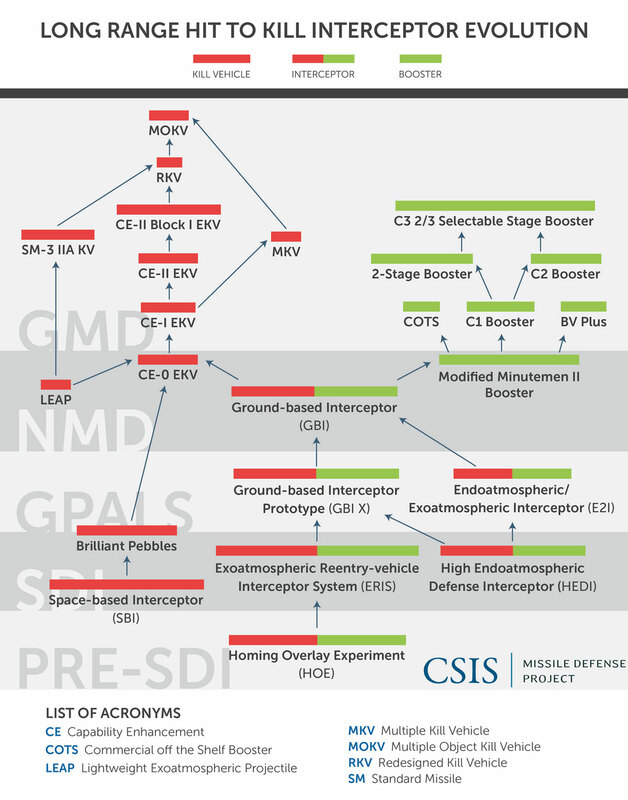 Missile Defense Project, "Ground-based Interceptor Development," Missile Threat, Center for Strategic and International Studies, April 7, 2017, last modified June 15, 2018, https://missilethreat.csis.org/ground-based-interceptor-development/. Vandenberg AFB serves as the test bed for the GMD system, from which GBIs are usually launched at targets fired from the Kwajalein Atoll. James D. Syring, “Ballistic Missile Defense System Update” (speech, Center for Strategic and International Studies, Washington, DC, January 20, 2016). This number includes intercept tests involving and GBI and a target, GBI-only flight tests, and GBI booster-only characterization tests. It does not include ground tests and sensor-only tests. Office of the Director, Operational Test and Evaluation (hereafter DOT&E), “FY 2000 Annual Report,” February 2001, VI-8. Richard Stevenson, “Missile System Passes a Test as a Target Is Destroyed,” New York Times, October 4, 1999, http://www.nytimes.com/1999/10/04/us/missile-system-passes-a-test-as-a-target-is-destroyed.html. DOT&E, “FY 2001 Annual Report,” February 2002, VI-5-7. James D. Syring, “Homeland Defense” (speech, 2014 Space and Missile Defense Symposium, Huntsville, AL, August 13, 2014). Missile Defense Agency, “Missile Intercept Successful,” MDA news release, October 14, 2002. DOT&E, “FY 2002 Annual Report,” 13. DOT&E, “FY 2004 Annual Report,” 330. DOT&E, “FY 2002 Annual Report,” 12. DOT&E, “FY 2005 Annual Report,” December 2005, 258. Edward C. Aldridge Jr., “Ballistic Missile Defense System (BMDS) Integrated Flight Test-9 (IFT-9),” Office of the Undersecretary of Defense, Memorandum, October 14, 2002. DOT&E, “FY 2006 Annual Report,” 230. The FTG-03 test was planned to utilize UEWR, but due to the missile failing before entering the radar’s coverage area, no data was collected. Office of Director, Operational Test and Evaluation, “FY 2007 Annual Report,” December 2007, 230. Missile Defense Agency, “Missile Defense Flight Test Results in Successful Intercept,” MDA news release, December 5, 2008. James D. Syring, “Ballistic Missile Defense Overview” (slide presentation, 2013 Space and Missile Defense Symposium, Huntsville, AL, August 14, 2013). Sensors used in FTG-05 included an A/N TPY-2, A/N SPY-1, the SBX, and the Upgraded Early Warning Radar (UEWR) at Beale. Office of the Director, Operational Test and Evaluation, “FY 2009 Annual Report,” December 2009, 245. Ibid. See also DOT&E, “FY 2010 Annual Report,” December 2010, 234. James D. Syring, “The Future of Ballistic Missile Defense” (speech, 2015 Space and Missile Defense Symposium, Huntsville, AL, August 12, 2015). Missile Defense Agency, “Missile Defense Agency Fiscal Year (FY) 2010 Budget Estimates: Overview,” April 27, 2009, 13. Sydney Freedberg Jr., “Return of the ABL? Missile Defense Agency Works on Laser Drone,” Breaking Defense, August 17, 2015, http://breakingdefense.com/2015/08/return-of-the-abl-missile-defense-agency-works-on-laser-drone/. Missile Defense Agency, “Missile Defense Agency Fiscal Year (FY) 2017 Budget Estimates: Overview,” February 2016, 2. James D. Syring, “Department of Defense Briefing by Vice Adm. Syring on the Fiscal Year 2016 Missile Defense Agency Budget Request in the Pentagon Briefing Room” (news transcript, Department of Defense, Washington, DC, February 2, 2015). James A. Cartwright, “President Obama’s New Plan for Missile Defenses in Europe and the Implications for International Security” (statement at hearing of the House Armed Services Committee, 111th Cong., 1st sess., October 1, 2009). Missile Defense Agency, “Multiple Kill Vehicle Completes Hover Test,” MDA news release, December 3, 2008.